After leaving a trail of destruction on the southern coast, Cyclone Ockhi is expected to make landfall in coastal Gujarat today with squally winds and heavy rainfall. Maharashtra, too, is on a state of high alert to deal with the side-effects of the stormy weather. A precautionary holiday has been announced for all schools in the coastal Maharashtra districts of Palghar, Thane, Mumbai, Raigad, Ratnagiri and Sindhudurg, in view of the predictions for the cyclone. Due to the impact of the cyclone, the city and its suburbs experienced rainfall since the morning, but it subsided by the afternoon. The financial capital had also experienced showers last night. The National Disaster Management Authority (NDMA) today asked fishermen in both eastern and western coasts not to venture out in the sea for the next three days as heavy rainfall is expected in many areas due to cyclone Ockhi, reports PTI. Asking people not to panic in case of a cyclone alert, the NDMA said in an advisory that fishermen along and off Andhra Pradesh and Tamil Nadu coasts should not venture into the sea from December 6 to 8 while fishermen along and off Andaman and Nicobar Islands are advised not to venture into sea till tomorrow. Fishermen living along and off South Gujarat and North Maharashtra coasts have been advised not to venture into the sea till tomorrow morning. As many as 39 people have perished and 167 fishermen were still missing after cyclone Ockhi hit Tamil Nadu and Kerala coasts while 809 others were swept away to Maharashtra, said a PTI report quoting Union Home Ministry. Joint Secretary in the ministry Sanjeev Kumar Jindal also said the cyclone is slowing down and would have no impact in Gujarat, where the first of the two-phased assembly elections is due four days later. "As of now, 10 people lost their lives in Tamil Nadu and 29 others in Kerala. Even though the exact number of missing persons were not known, as per available information, whereabouts of 74 fishermen in Tamil Nadu and 93 fishermen in Kerala is not known yet," he told reporters in New Delhi. 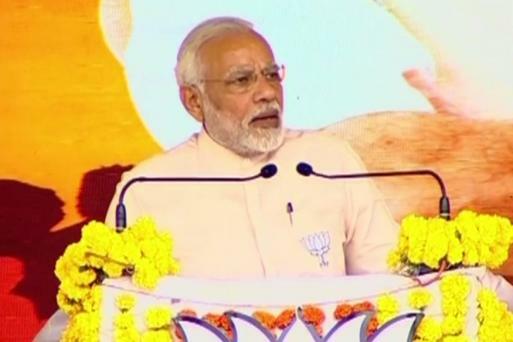 Prime Minister Narendra Modi appealed to BJP workers to extend a helping hand to those that would be likely hit by the cyclone, which is expected to make a landfall on the state's southern coast in Surat by tonight. The Kerala government has cancelled the inaugural ceremony of the upcoming International Film Festival of Kerala (IFFK) in the wake of cyclone Ockhi affecting many districts in the state, reports PTI. The IFFK, which attracts a large number of cinema aficionados and film personalities from across the country, is scheduled to begin Thiruvananthapuram on December 8. The IMD has said that the Cyclone Ockhi is 230 km South-Southwest of Mumbai and is likely to continue moving North-Northeast. The storm will weaken gradually and cross the South Gujarat, North Maharashtra coast. Mumbai city or its suburbs will not be affected. Cyclone Ockhi has moved closer to the southern coast near Surat in Gujarat and is expected to make landfall in the state around midnight, said officials. As per the latest forecast released by the Meteorological Centre here, the cyclone is now just 390 km away from Surat. The cyclone is approaching Gujarat steadily and now lies centred in the Arabian Sea just 390 km away from Surat. It is very likely to continue moving north-northwestwards, an official of the MeT centre said. National Disaster Management Authority says light to moderate rainfall is expected at most places in Maharashtra, with isolated heavy rainfall over the North Konkan region, over the next 24 hours. With #CycloneOckhi expected to make a landfall in Gujarat, I appeal to @BJP4Gujarat Karyakartas to focus on helping people across the state. Our Karyakartas should devote themselves to providing all possible assistance and stand shoulder to shoulder with fellow citizens. Continuously monitoring the situation arising in various parts of the country due to #CycloneOckhi. Spoke to all relevant authorities and officials. All possible assistance is being provided to those affected. 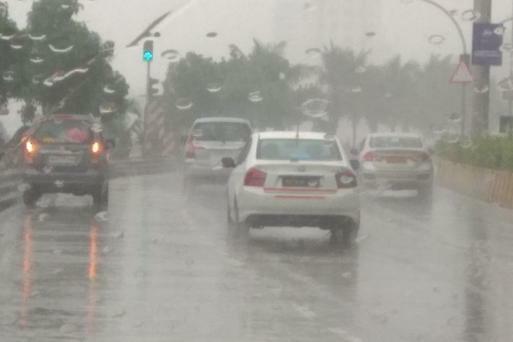 As Mumbai braces for Cyclone Ockhi, areas near the metropolis witnessed a spell of hailstorm early today. The weather department has forecast intermittent rains in Mumbai and suburbs in the next 24 hours. The traffic on Eastern and Western Express Highways in Mumbai has slowed down. There are traffic curbs in some places in view of the rush of followers of Dr Babasaheb Ambedkar on his death anniversary tomorrow. Central Railways is running 10 minutes late, but the frequency of local trains in Mumbai hasn’t been affected, a Railway official tells CNN-News18. Public Relations Officer for the Mumbai Airport says flight operations haven’t been affected. In a port warning issued, the MeT Centre said, "Sea condition would be rough. Fishermen (have been) advised not to venture into the sea till December 6. Hoist Distant Warning Signal Number 2 at all ports". According to an official release, Gujarat Chief Minister Vijay Rupani held an urgent meeting with senior officials to take stock of the preparedness. During the meeting, he was apprised that as many as 50 boats from Kerala had drifted towards Gujarat's Veraval coast due to the cyclone, it said. According to the IMD forecast, wind velocity would remain between 50 kmph to 70 kmph when Cyclone Ockhi makes landfall in Gujarat today. In view of the adverse weather conditions, the RoRo ferry service between Ghogha and Dahej across the Gulf of Khambhat has been suspended. The service, inaugurated recently by Prime Minister Narendra Modi, would resume on December 6 subject if the weather conditions are suitable. 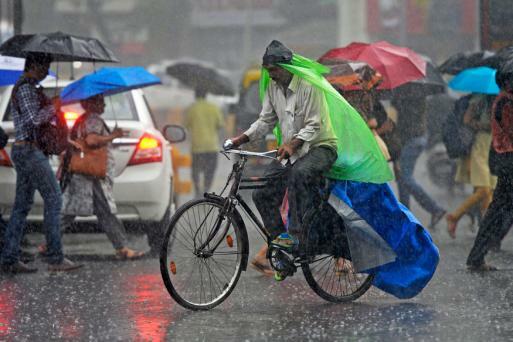 According to the IMD, Gujarat is very likely to experience a wet spell during the next four days. After leaving a trail of destruction on the southern coast, Cyclone Ockhi is expected to make landfall in coastal Gujarat on Tuesday midnight with squally winds and heavy rainfall. Two National Disaster Response Force (NDRF) teams each have been deployed in Gujarat’s Surat, Navsari, and Rajkot districts. The Army, Navy, and the Border Security Force (BSF) have been alerted in the view Cyclone Ockhi’s landfall. "According to the IMD forecast, Cyclone Ockhi would enter south Gujarat tomorrow (Tuesday) midnight. This will the impact coastal areas from Umargam (in south Gujarat) till Gir Somnath district (in Saurashtra). We have directed local civic officials as well as the collectors to remain prepared and take all necessary steps for the safety of the people," Revenue Department Principal Secretary Pankaj Kumar told reporters in Gandhinagar. Here’s what a forecast by India Meteorological Department (IMD) says: "The severe cyclonic storm Ockhi is now laid centered about 850 km south-southwest of Surat and is likely to cross south Gujarat and adjoining North Maharashtra coasts near Surat as a deep depression by midnight of December 5."